String thin necklaces and bracelets through straws. Trim the straws if you need to, and then lay them flat in a box (or cookie tin, if that’s all you’ve got!). (I lined mine with a dish towel first to prevent movement.) They can’t get tangled this way. 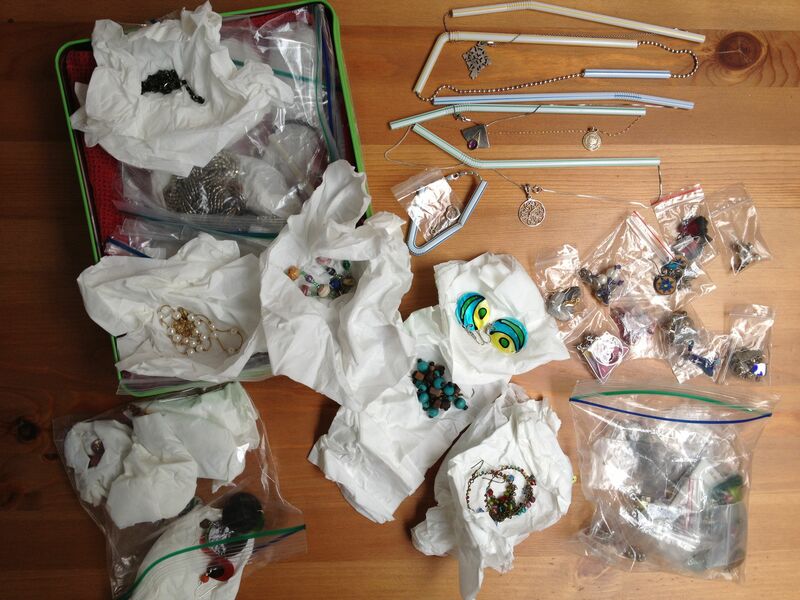 Wrap bulkier necklaces/bracelets in tissues and then sort into ziploc bags. Whenever new clothing came with an extra button or thread in one of those tiny ziploc bags, I’d toss it into a box on my dresser. While consolidating, I stashed all those buttons in a craft box, and saved the bags for my earrings. Depending on size, pack one or more pairs of earrings in these tiny bags and store in a larger bag. Bigger earrings can also be wrapped in tissues and then packed. Four months after moving across the country, I’m finally unwrapping the rest of my jewelry and hanging it on a new frame. Each piece is perfectly fine, and knot-free.